We have reviewed, rated and compared Carrier air conditioners so you can buy with confidence. These AC’s are not for suitable for everyone so check to see if they fit your needs! Purchasing an air conditioner might be one of the costlier investments you’d ever make, but it is a necessary one, to say the least. The demand for air conditioners is on the rise due to rising temperatures and increasing focus on efficiency on behalf of HVAC (heating, ventilating, and air conditioning) manufacturers. 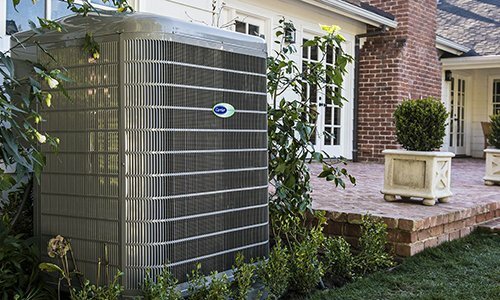 When looking for a good central air conditioner, whether your focus is efficiency, noiseless solution, or a sleek design, the name of Carrier air conditioners is bound to come up, because it is the very same company that invented modern air conditioning techniques. Carrier is one of the oldest air conditioning brands out there, with no particular focus on a single niche when it comes to their products, meaning it takes an ‘all-rounder’ route. 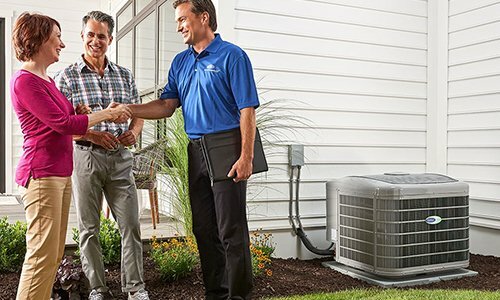 Carrier enjoys a market share of a staggering 17%, making it the top HVAC brand. Here, we will dive deeper into the different AC units Carrier has to offer, to figure out whether Carrier air conditioners are the best choice for you or not. Carrier is a good all-round AC manufacturer with a unit for everyone. Whether you value silence, efficiency, sleek design, good cooling, or all of the above, Carrier has a product for you from its three different series and eighteen units. However, Carrier has one major flaw: unreliability. Customers are content with every aspect of Carrier except one. It is inexpensive to buy, offers tax rebates, and has excellent customer service. However, its parts are unreliable, which results in them breaking down from extensive use. Carrier is a good choice if you live in a region with less heat intensity. However, in hotter regions, Carrier units are prone to breaking down unless you buy the premium version, the Carrier 24VNA0. Choosing the right air conditioner for your house is paramount if you wish to save up on running costs and achieve the optimum cooling level at the same time. Although not the most efficient central ACs in the market, Carrier air conditioners are still among the top 6 HVAC brands when it comes to their average SEER. As mentioned above, Carrier AC units have always adopted the middle road in everything, and with three different conditioner series, and 18 distinctive central air conditioning units, you get a slew of options when it comes to choosing what you want from your AC; be it comfort, efficiency, or silence. Below is a table comparing the cost of purchasing, installing, and running each of Carrier’s air conditioners. Carrier has an average SEER of 16.66, which is quite ordinary when compared to other brands. Carrier claims to tackle this ‘mediocrity’ with the fact that its air conditioners are low cost and low maintenance. These low-cost units attract a bigger customer base; since spending less initially is a much more attractive option than saving more in the long term, giving Carrier AC units a competitive edge. To estimate how much energy your Carrier air conditioner is consuming per year, you can follow the steps given below. Check your unit’s tonnage and SEER. Calculate the wattage of your unit. It is usually 240 volts, but recheck just to be sure. Multiply the wattage with your amperage. Divide the answer by 1,000. This will give you your usage in kWh. Multiply the extracted figure by the number of usage hours to extract the cost of each unit. Carrier air conditioners are available ranging from 1.5 tons all the way up to 5 tons, offering versatility regarding different sized houses and rooms. Carrier’s premium unit is the 24VNA0 with a SEER up to 20.5. It belongs to the Infinity Series and also includes Greenspeed Intelligence technology for better cooling, more efficiency, and quieter performance. Although the same technology is used in several other models, customers haven’t found them up to the mark and have often complained about the noise and frequent breakdowns. Carrier air conditioners with a SEER over 16 are also eligible for government tax rebates of up to USD 300 upon purchase, thus resulting in even cheaper units overall. Installing an expensive piece of equipment such as a Carrier air conditioner might seem easy from afar, but that is not the case. The installation process doesn’t just involve connecting a few wires, screwing some couplers, and pushing a button. The entire procedure includes minute details that you must keep an eye on, in order to ensure proper installation. Loose wires or bad connections can reduce the life of your air conditioning unit from 15 years down to 5 years! You’ll end up losing more than you save by not hiring a good HVAC contractor. Hiring a quality HVAC contractor can help you keep your unit’s 15 years of life (or even more!) if you keep it well maintained, and the best place to look for one is Modernize.com. There are numerous HVAC contractors on the website that can install your Carrier air conditioner, quickly and in the proper manner, following your state’s codes and regulations. Modernize has a user-friendly process and screens all the contractors near you, listing them according to the level of success on jobs and customer ratings. This makes it convenient for you; giving you plenty of options to decide on a contractor and see whether they can perform your task or not at a reasonable price, beforehand. To make that process even easier we have added these questions below. Just fill them in and you will be on your way to a cooler summer! Although Carrier air conditioners are named in a very distinctive and expressive manner such as the “Infinity® 20 Air Conditioner With Greenspeed® Intelligence”, but when looking to claim your warranty or any other type of support, you need to be aware of the air conditioner’s model number and what it signifies. For example, the air conditioner mentioned above is conveniently modeled ‘24VNA0’. All three Carrier series focus on a specified area while staying mediocre in the rest. The Infinity series features (relatively) quiet units, good build quality, and high SEER ratings. The Comfort series focuses more on silence, while the Performance series is all about combining low costs, good SEER, and convenient control features. The abbreviation SEER has been used quite extensively throughout our Carrier AC review. So let’s dive into what SEER actually is and why it’s so important when it comes to air conditioners, and HVAC units in general. Introduced by the Air Conditioning, Heating, and Refrigeration Institute in 2008, SEER or Seasonal Energy Efficiency Ratio is a measure of the ratio of how much energy is consumed to the unit’s BTU when the unit is running. Simply put, it is a method of calculating the efficiency of air conditioners, heaters, and refrigerators. A number of people use EER rating as well, which eliminates the Seasonal (S) from the rating to measure the efficiency of your units all-year-round, at varying temperatures, and not just when it’s cooling. The higher your unit’s SEER or EER is, the more energy-efficient it is. While some Carrier air conditioners are efficient and easy on the wallet, the same can’t be said about all of them. There are a number of HVAC brands, including Trane, Lennox, LG, and Mitsubishi, that offer much more efficient air conditioners. However, they fall short when it comes to the low prices Carrier has to offer. An air conditioner has multiple parts working together to cool hot air and blow it out into your house, and none of these parts can be stated as unimportant when it comes to the proper functioning of the air conditioner. The compressor is one such component, perhaps the most critical component of all; also called the ‘heart’ of air conditioning systems, and rightfully so. Your air conditioner’s compressor is mostly responsible for moving Puron (R-410a refrigerant gas) throughout your unit’s coils. This is done with the help of high pressure that cools the Puron down and turns it into a liquid in the process. When hot air, taken from your house, passes through the coils holding the cold Puron, it gets cooled down and thrown back into your vents and home. There are two types of compressors: single and two stage. Single stage compressors have only one phase – running at full speed when cooling the house. Once your house cools down, and the intake air is no longer hot, the compressor turns off only to run again when the intake becomes hot. The high speed of single stage compressors means that they can cool your house pretty quickly, but the constant switching on and off consumes more energy due to inertia and results in higher electric bills and fluctuating temperatures. Two-stage compressors are much more efficient in the sense that they can run on both, high and low speeds. They run on high speeds when cooling the room and once the desired temperature is achieved they slow down to maintain the room’s temperature. Inertia is maintained at the low speed, thereby, making two-stage compressors more energy efficient. Carrier AC compressors are available in both single and two-stage. Condenser fan motors are also of two types; single and double speed. Located in the outdoor unit of your air conditioner, the condenser fan helps keep the unit’s condenser cool when it is running, hence the need for two types. Single stage compressors require single speed condenser fans, while two-stage compressors require double speed. Carriers’ 24ACB7, 24ACC6, 24ACB3, 24AHA4, 24APB6, 24AAA6, 24ABC6, 24AAA5, 24ACC4, 24ABB3, 24ABB3**C, and 24ACA4**C all feature single speed fans. While the 24VNA0, 24ANB1, 24VNA9, 24ANB7, 24ANB7**C, and 24ANB6 feature double speed condenser fans. You can also use Carrier’s air conditioners to heat your house instead of it being a resting place for insects during winters. Most HVAC units have heat pumps, or compressors that act as heat pumps. For heating, these compressors put negative pressure on Puron to make it hot. When cold air passes through these warm coils, they effectively turn your air conditioner into a heater. Carrier air conditioners belonging to the Comfort series are all focused on quietness. They achieve this objective thanks to their sleek designs and insulated bodies. The body is made up of metal but uses materials such as rubber, thermosetting plastic, or other noise absorbents to reduce the noise your unit makes. The 24ANB1 is Carrier’s quietest model that can go as low as 40 dB, which is like someone talking very lightly, at a distance! Not only is the 24ANB1 quiet, other Carrier AC units from the Comfort series are silent as well, though there are a number of competitors, including Haier, that can beat Carrier’s level of quietness. Warranty is a major selling point for many HVAC manufacturers such as Goodman, Lennox, Trane, etc. To make their units seem more attractive, these manufacturers offer lifetime warranties on parts, with a few years of warranties for labor as well (under certain conditions). Carrier air conditioners are widely known for their top-of-the-line customer support. However, their warranty periods lag somewhat behind, as they don’t offer lifetime warranties. They offer a limited warranty for air conditioner & heat pump condensing units with Puron® (R-410A) refrigerant, meaning they give their customers only 5 years of limited warranty on replacement parts and compressor. However, if you register your product within 90 days of purchase, these periods will extend up to 10 years each! Carrier not only offers warranties to new users, but also a 5-year warranty to subsequent owners. You can also purchase an Extended Warranty if you wish, which will cover, not only the cost of parts, but also the labor. However, you can hire quality labor with modernize.com, which makes it more than easy to find screened and trusted HVAC contractors around you. Some governments also offer tax rebates for buying air conditioners above a specific SEER (16 or above) or EER (13 or above), while those below SEER 13 are considered illegal in some states. This tax rebate is for buying high-efficiency equipment, such as high SEER air conditioners, efficient heaters, refrigerators, etc., allowing users that buy a more efficient air conditioner to save on their taxes as well! There are a number of Carrier Air Conditioners with SEER 16 and higher and are eligible for a tax break of USD 300 on each unit purchased. Carrier Corporation is a brand of HVAC units, under United Technologies Corporation, and was founded in 1915. It is headquartered in Charlotte, North Carolina, and is responsible for revolutionizing the air conditioning industry by introducing modern cooling techniques. Carrier now employs more than 43,000 people and has a number of manufacturing plants, serving in 170 different countries. With assets worth over $12.5 billion, it is one of the most diverse and influential HVAC providers in the market. However, every AC brand has its pros and cons, and Carrier is no exception. Customers often steer away from Carrier AC units for a number of reasons. Following are some pros and cons of Carrier air conditioners. No matter how much a manufacturer spends on marketing and sales, it is often the word of mouth that determines whether others buy the products or not. Most people conduct extensive online research and try to learn what others have to say before buying something. While we have tried our best to give you a clear picture, here are some reviews by people who purchased Carrier AC units. Purchased a new Carrier A/C unit in April 2018. The nightmare started 3 months later. As of today mid-Aug 2018 I have had service people out 4 times. Every time it’s something different. When I mentioned I was going into the office because we want a new unit, the tech told us that Carrier is known for replacing every single piece but the shell before they replace a unit. Unbelievable! It’s 90 degrees in my home upstairs. I cannot believe we are going through this with a brand new AC unit. – Iris, Melbourne. Consumeraffairs. I bought it in 2014. No issues at all. It consumes less electricity compared to others. Economical and efficient cooling. It’s durable and safe to use. The company has its own status. Easy to use controller. Low service also costs and available at one call. – kdsb88, Mouthshut.com. As is clear from these reviews, some customers aren’t satisfied with Carrier’s reliability. However, the customer service always reaches the customer to find a solution for the problem whether it is or isn’t under warranty. Carrier is an excellent all-rounder if you aren’t looking to spend a lot of money, but wish to get an efficient and noiseless cooling solution. Its warranties (if registered) stand out against many available brands. However, as mentioned above, Lennox, Goodman and other HVAC manufacturers can give you much better warranties. If you wish to have a good and somewhat reliable air conditioner from Carrier, you need to invest in its best unit, the 24VNA0. People who bought this unit were quite content with their purchase. If you are looking to save some cash and going to buy a less premium unit, you might have to face customer service representatives sooner than you’d like. In order to get the best out of your air conditioner, use the widget below to find the best, trusted HVAC installers, and get the best quotes and help with installing your new AC or getting an upgrade.